In 2012 Ray was working a dead end job, but an experience running an eCommerce store brought him a new intrigue for programming. He joined Treehouse, started learning to code and less than a year later he landed his first job. 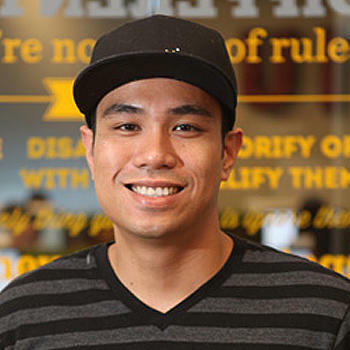 Today, Ray has a career that he loves as a web developer in San Diego. He also still spends his free time on Treehouse working to build and expand on his skills. Tell us a little about what you were doing when you first started learning with Treehouse a year ago. Did you have prior coding experience? In early 2012 I was working a dead end job. Life was not looking good and I did not have any college or professional work experience. I did not know how to code at all. What inspired you to become a web developer? I built an eCommerce store importing instruments in early 2012 using a WordPress theme and realized that I enjoyed creating and modifying websites. Then in July of 2012 I found out that I was having a son. I buckled down and studied HTML and CSS for 10 to 14 hours a day 7 days a week. I just wanted to make sure that I had a career to support my son by the time he was born. I landed my first job in November 2012. My son was born March 15, 2013. Tell us a little about your learning experience with Treehouse over the past year. If you are going to start doing web development you will be thankful that you did a year from today. Tell us about your job at High Rank Websites. It’s an awesome work environment. We just got ranked as one of the best places to work in San Diego. There is a ping pong table, beer, cool people, and awesome projects. There is also health, vision, and dental insurance. Best job I've ever held in my life. How has Treehouse helped you get to where you are today, and what does the value of a Treehouse education mean to you? I can thank Treehouse for almost everything I have today. I went through all the advanced content and then found a mentor/tutor on Craigslist to help guide me into a career. It was the best investment I have ever made. Is there any advice you’d like to share with other Treehouse students and aspiring web developers? If you are going to start doing web development you will be thankful that you did a year from today, but the window may be closing as more and more people realize the potential of this industry. Get on it ASAP! Visit my blog, Raysinlao.com for any tips that you need on your journey to becoming a web developer. Contact me through my contact form if you need any help. I will do as much as I can to help other aspiring devs!